The Bushranger Spinnerbaits are suitable for Murray Cod, Yellowbelly, Bass & Redfin. 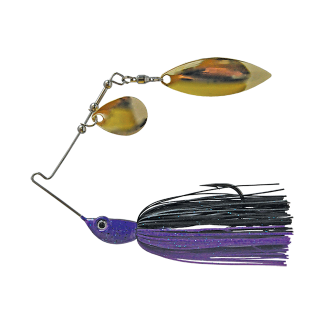 The Bushranger Spinnerbait has an enticing pulsating action that fish find very appealing with twin blades, one each of Willow and Colorado shape. The Bushranger Spinnerbaits feature the highest quality fittings and includeSilicone Silk Cut Skirts, Rolling Swivel and a Wire Tied Skirt Holder.